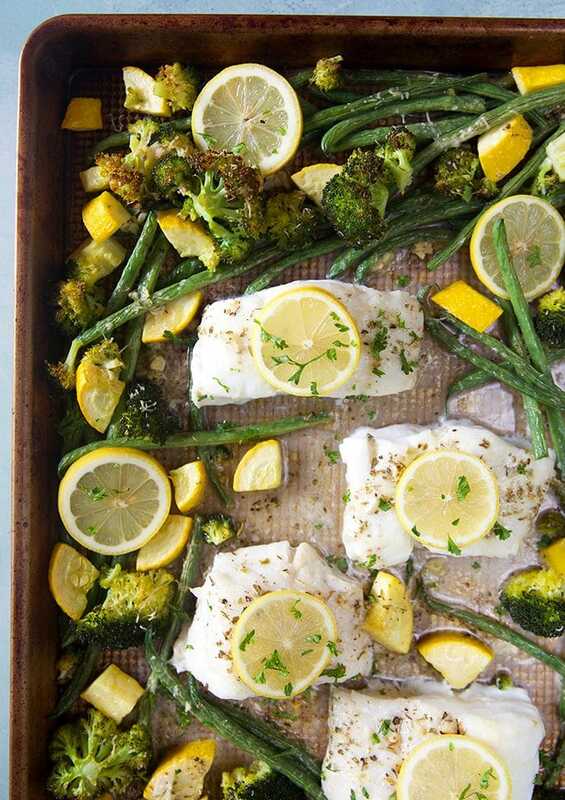 A simple sheet pan dinner that’s ready in less than 30 minutes, this Lemon Baked Cod recipe is quick to make for busy weeknight dinners. Garlic, parmesan and lemon butter sauce are the best flavors to complement the tender Baked Cod. Mom approved and kid friendly! We’ve been trying our hardest to add fish to our weekly menu but, as easy as it is to make, sometimes the fish recipes I try out from other blogs leave me with flavorless, dry fish. 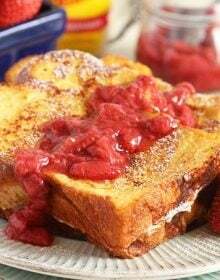 I know I can come up with my own recipes (and I always end up doing that) but sometimes I’ll see something on Pinterest that looks amazing only to leave me disappointed knowing I could do better on my own. 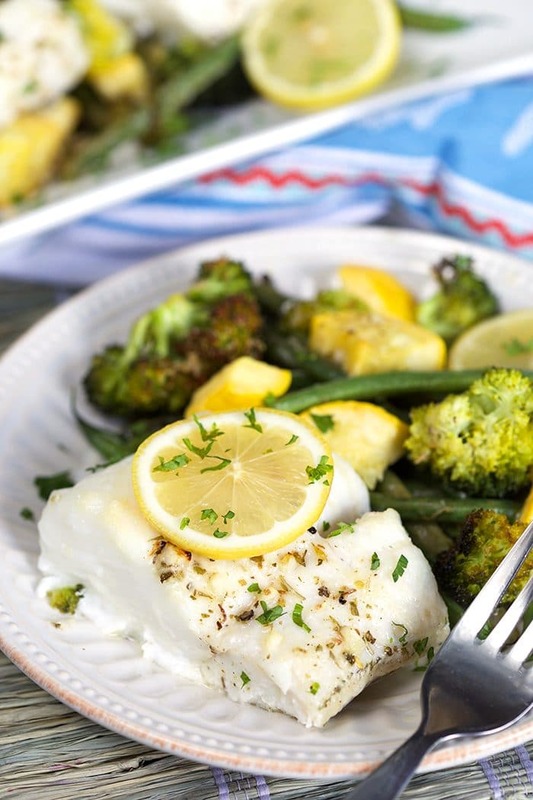 Enter this Lemon Baked Cod with Parmesan and Vegetables. The sheet pan dinner that trumps all other sheet pan dinners. This one pan Lemon Baked Cod is drizzled with a lemon butter sauce and sprinkled with parmesan cheese before being baked in the oven to a tender, flakey, moist bite of heaven. With lent just around the corner, I wanted to add to our arsenal of fish recipes so we’re not left with Pizza Friday every single pizza Friday. Know what I mean? This Baked Cod Fish recipe is just the thing you need to help mix things up during those few weeks where meat is off limits at the end of the week. Is Cod a good fish to eat? Short answer….YES. Cod is a great fish to eat and is relatively inexpensive compared to other varieties of fish. It’s a good source of heart healthy Omega-3 fatty acid and is rich in lean protein, as well as, B-12. What does cod fish taste like? A lean saltwater fish, cod has a milder, sweet flavor with a delicate texture that appeals to most non-fish eaters who are afraid of fishy tasting fish. It’s fantastically tender and stays moist during baking. 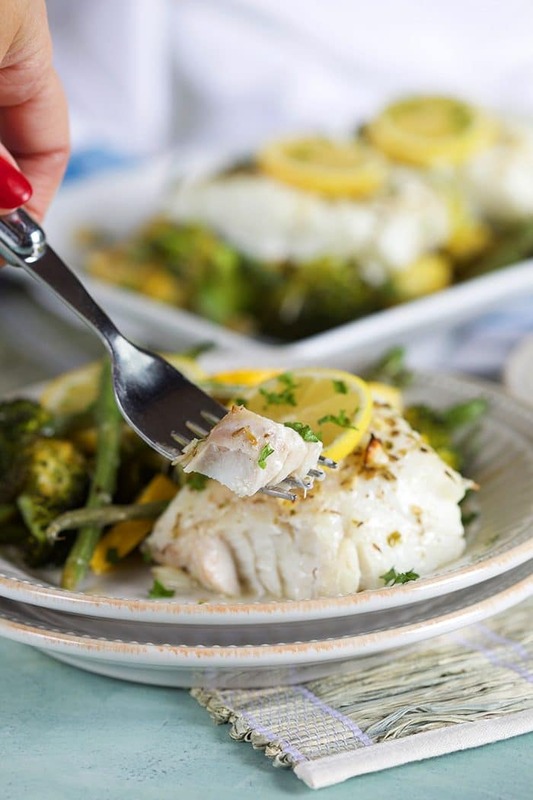 This easy Lemon Baked Cod recipe is so simple to make and with just one pan to clean. Line that pan with foil and clean up will be a breeze! Line a baking sheet with foil and arrange the cod fillets on the baking sheet. Arrange your vegetables around the fish and set aside. In a small bowl, whisk together melted butter, lemon, pepper, garlic and herbs. Drizzle the butter over the fish and vegetables. Sprinkle the fish with parmesan cheese. Bake for 15 minutes or until the cod loin flakes easily with a fork. Remove from the oven and serve immediately with lemon slices, if desired. For oven temperatures of 325 degrees, bake your cod fillets for 20-25 minutes. For oven temperatures of 350 degrees, bake your cod fillets for 15-20 minutes. For oven temperatures of 400 degrees, bake your cod fillets for 10-15 minutes. I prefer to go with a higher temperature and shorter baking time for my cod as I feel it tends to leave me with more tender cod fish fillets. Plus, dinner’s on the table quicker leaving me with less hangry family members in the kitchen. Ya dig? 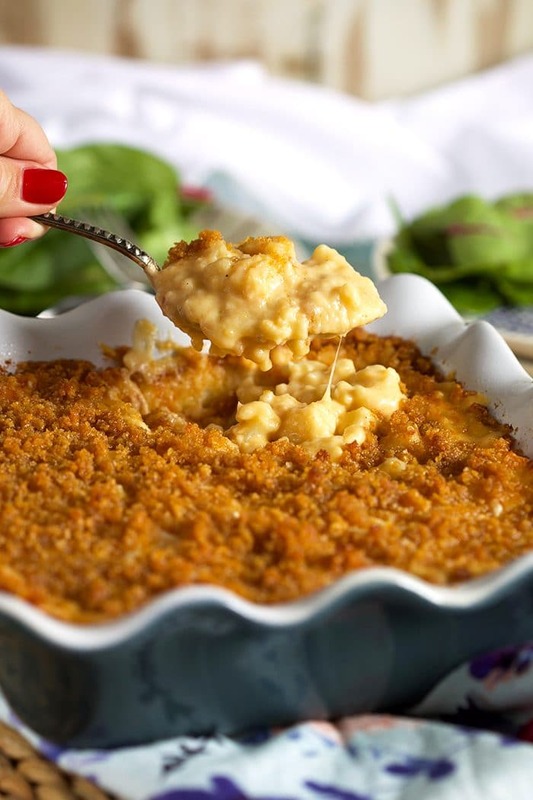 Baked Cauliflower Mac and Cheese.….soooooo good! Easy Spaghetti Aglio e Olio, my personal favorite. Easy Grilled Garlic Potatoes….they can be made in the oven too! 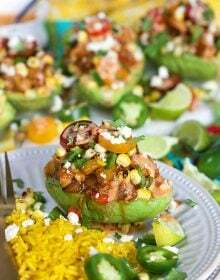 Want even MORE easy fish recipes? You HAVE to try these! 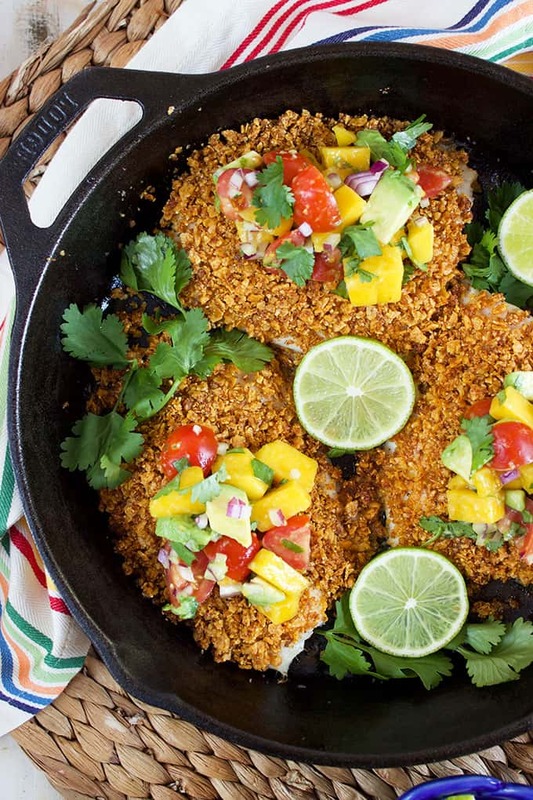 Tortilla Crusted Tilapia with Mango Salsa….so amazing. Sweet Chili Orange Glazed Salmon…dinner in 20 minutes. 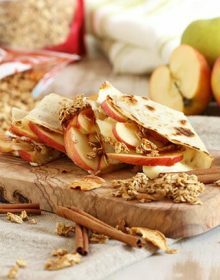 For more recipe inspiration (and behind the scenes antics)….follow us over on Instagram! 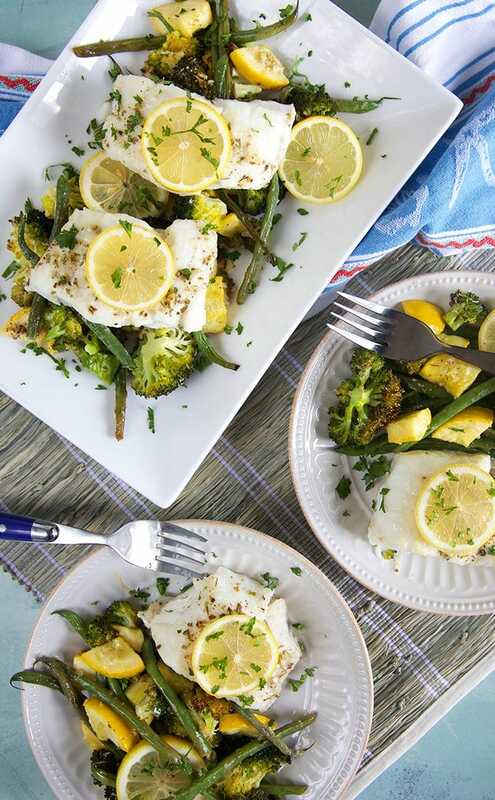 Fresh and healthy, Lemon Baked Cod with Parmesan and Vegetables is the one pan meal the whole family will love. 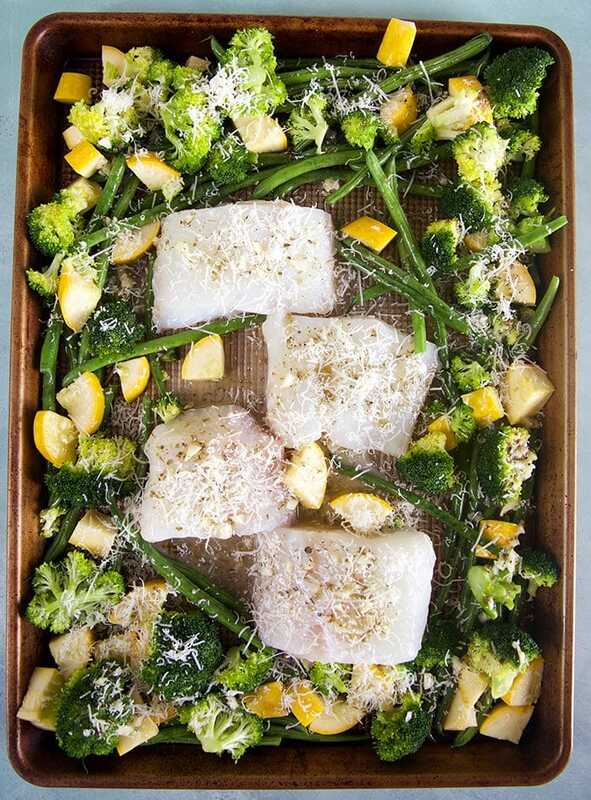 Arrange the cod on a baking sheet lined with foil or parchment paper. Scatter the vegetables around the cod and set aside. In a small bowl, whisk together the butter, italian seasoning lemon zest, lemon juice, salt and pepper. Pour the lemon butter sauce over the fish and vegetables. 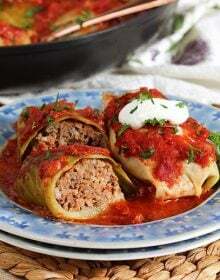 Toss the vegetables lightly to coat. Sprinkle the parmesan cheese over the fish. Transfer the baking sheet to the oven and bake for 15-20 minutes or until the fish is no longer translucent and flakes easily with a fork. 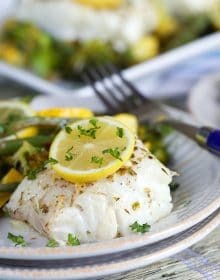 Remove the cod from the oven and serve with the veggies alongside lemon wedges, if desired.